There is ongoing debate regarding the best mammography screening practices. Twitter has become a powerful tool for disseminating medical news and fostering healthcare conversations; however, little work has been done examining these conversations in the context of how users are sharing evidence and discussing current guidelines for breast cancer screening. 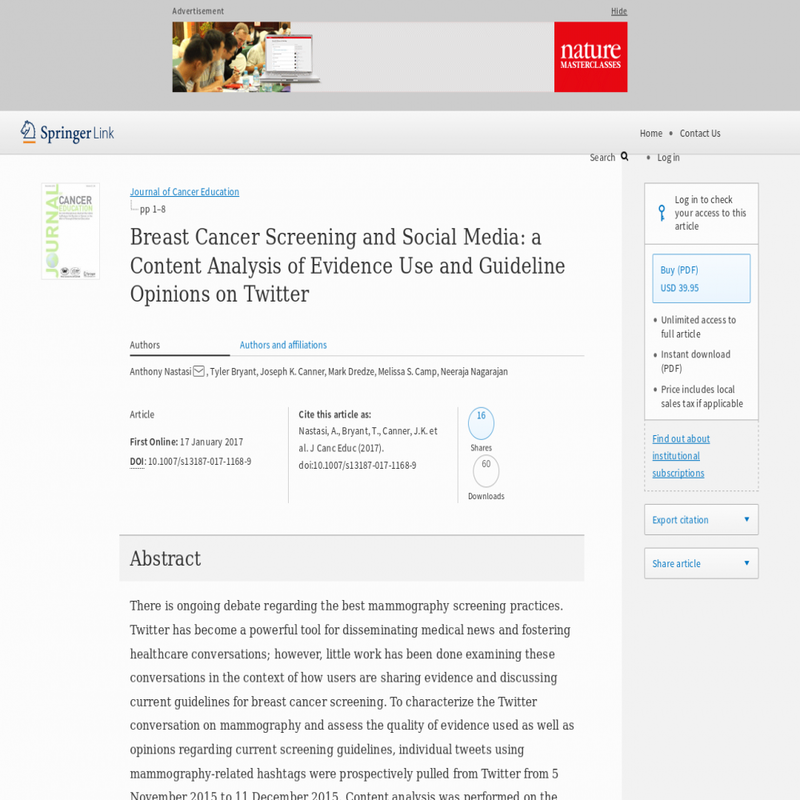 To characterize the Twitter conversation on mammography and assess the quality of evidence used as well as opinions regarding current screening guidelines, individual tweets using mammography-related hashtags were prospectively pulled from Twitter from 5 November 2015 to 11 December 2015. Content analysis was performed on the tweets by abstracting data related to user demographics, content, evidence use, and guideline opinions. Standard descriptive statistics were used to summarize the results. Comparisons were made by demographics, tweet type (testable claim, advice, personal experience, etc. ), and user type (non-healthcare, physician, cancer specialist, etc.). The primary outcomes were how users are tweeting about breast cancer screening, the quality of evidence they are using, and their opinions regarding guidelines. The most frequent user type of the 1345 tweets was "non-healthcare" with 323 tweets (32.5%). Physicians had 1.87 times higher odds (95% CI, 0.69-5.07) of providing explicit support with a reference and 11.70 times higher odds (95% CI, 3.41-40.13) of posting a tweet likely to be supported by the scientific community compared to non-healthcare users. Only 2.9% of guideline tweets approved of the guidelines while 14.6% claimed to be confused by them. Non-healthcare users comprise a significant proportion of participants in mammography conversations, with tweets often containing claims that are false, not explicitly backed by scientific evidence, and in favor of alternative "natural" breast cancer prevention and treatment. Furthermore, users appear to have low approval and confusion regarding screening guidelines. These findings suggest that more efforts are needed to educate and disseminate accurate information to the general public regarding breast cancer prevention modalities, emphasizing the safety of mammography and the harms of replacing conventional prevention and treatment modalities with unsubstantiated alternatives.